One hundred years after Thomas Moran painted his 1912 work Grand Canyon with Rainbow (left), we discovered it pretty much exactly as he had left it (right). A collection of travel-related magnets on a friend’s refrigerator in Seattle recently inspired a guessing game; one of our newfound favorites, actually. It’s the same game we played to an audience of salespeople at a Peter Lik photography gallery in Las Vegas. To their great annoyance (and our great amusement) we showed far less interest in spending thousands of dollars on glossy, wall-sized landscapes than we did in guessing their location. Everything from postcards and refrigerator magnets to museum quality photographs and Monets has taken on new meaning for us. No longer do we just see these images as the artist intended but equally and perhaps more powerfully through the rosy reflections of our own memories. Nowhere was that more true than at San Francisco’s de Young Museum, whose collection of North American landscapes made a picture-perfect scrapbook for our own great American road trip. For Gustav Grunewald, Niagara Falls was the ultimate example of divine power and sublime beauty. Nearly two centuries after he painted The Niagara River at the Cataract (1832), we found the mighty falls still thundering and every bit as impressive. 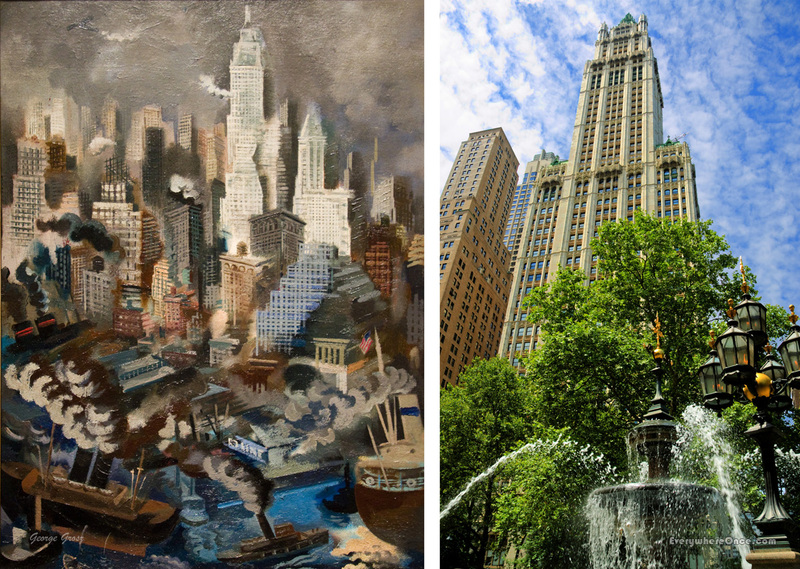 The steamships George Grosz depicted in Lower Manhattan (1934) no longer dock there, but amidst the city’s urban sprawl traces of the bygone era remain, like the ornate Woolworth Building. Short on funds and unable to hire models to pose for him, Albert Lorey Groll gave up figure painting and turned to nature. The centerpiece of his 1907 work The Morning Glory Spring, Yellowstone, one of the park’s otherworldly thermal pools, was blooming bright when we arrived in 2012. Thomas Moran’s images of Yellowstone helped sway U.S. Congress members to vote in favor of establishing the area as the first national park in 1916. While there we sought out the Upper Falls of the Yellowstone River, the same waterfall the artist rendered in his 1906 painting Grand Canyon of the Yellowstone. Thanks for introducing me to the two Thomas Moran paintings 🙂 They’re lovely. Love the magnet versus real photo. Reminds me of John’s Fielders Colorado Then and Now http://www.johnfielder.com/shop/. I might have to borrow this idea some day. Thanks for these – great contrasts and similarities. Very dramatic pics. De Young Museum… where I grew up with art. You must have some amazing memories and have definitely convinced me. Thanks. I LOOOVE this idea! “Memory lane” for road-trippers.